Directions: Preheat the oven to 350 degrees. Cut the squash into halves and remove the seeds. Place flesh side up on the baking sheet. When the oven has reached temp place the cooking sheet with the squash in the oven. Fill the loaf pan or baking dish with water and place beneath the squash in the oven. Cook for an hour (30 minutes with delicata squash). In the medium sauce pan cook the chosen grain according to the packages instructions. In the large sauté pan heat the cooking oil on medium heat. When the grain is almost finished cooking chop and add the onion to the heated oil. Season with a pinch of salt and pepper. Chop and add the garlic and apples or celery to the onions. Stir to combined and cook until softened. When the grain is finished cooking add to the sauté pan and stir to combined. Season with salt and pepper. Add the chopped walnuts and dried fruit. Season with cinnamon. Turn off the burner once the mixture is evenly distributed and thoroughly heated. When the squash are finished cooking and are fork tender remove from the oven. Pour about 1/2 Tbsp. 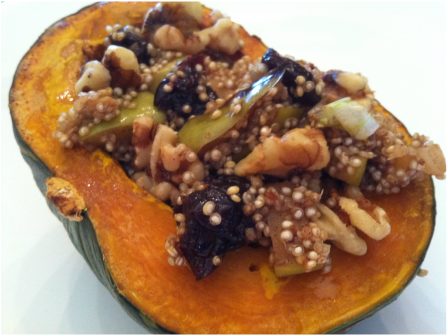 of the Maple syrup in the bottom of each squash and spoon the whole grain mixture into the squash. Drizzle the remaining maple syrup evenly on each squash. Return the stuffed squash to the oven and allow to bake for 10 - 15 min. Remove squash from the oven and serve hot.